Heir to the Throne is one of our great new finds that will be exhibiting at MamaMagic, The Baby Expo in Johannesburg this week from 17 – 20 May at the Coca-Cola Dome. You can find their kids toys and accessories at Stand 203. Their range includes wooden toys, books, posters and educational toys. If you’re tired of the noisy give-mom-a-brain-ache toys that your friends love to buy for your kids, then be sure to make your way to this stand. 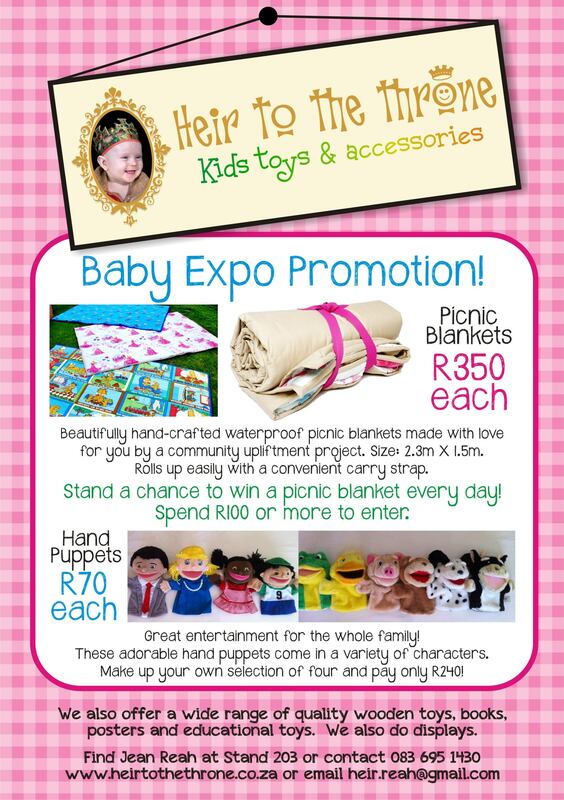 Don’t miss their Baby Expo Promotion! Spend R100 or more and you could win a beautiful waterproof picnic blanket, hand-crafted by a community upliftment project, to the value of R350. Want to know more about Heir to the Throne?